Many children join the congregation in the sanctuary for the first time during the Advent Christmas season. Some come with families who are trying out church for the first time or are visiting church-going friends or family. Some are brought from the nurseries by their worshiping parents who think maybe they are ready to share the traditions that are so precious to their parents. Lighting the candles of the Advent wreath, the presence of a crèche and/or Chrismon tree, other visual decorations of the season, and the birth stories all appeal to children. With we introduce these things so that children know what they are about and adults understand them more deeply, we lead these newcomers to become ever more fully participating worshipers.
' 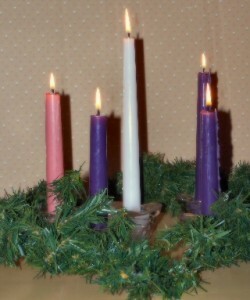 Advent is a time when many congregations go “off lectionary” for at least a Sunday or two. Sometimes they do that to accommodate special music and pageants. But more and more people are doing it because they sense the need to spend more time with the Christmas stories than with the early Advent texts. Since we often see more marginally involved folks in worship during December and since we can no longer count on public schools to teach the basic stories, it also feels increasingly important to present the key nativity stories in worship when people are expecting to hear them.
' Given these things and this year’s calendar with the fourth Sunday of Advent falling the day before Christmas Eve, I’d be inclined to combine the three readings about John the Baptist birth and ministry turning Advent 2 into John the Baptist Sunday. I’d add the annunciation story to Mary and Elizabeth’s visit and move it from week four to week three where it fits the rejoice theme in the other texts. And then work with Luke 2:1-5 and 7c to create a “ready or not” theme calling worshipers to cross the unimportant stuff off their lists for the next few days and beyond in order to be ready to respond to God for the fourth Sunday.
' 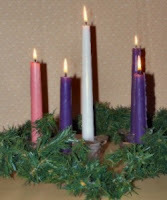 Check out another alternative Advent lectionary created for just this purpose at Rumors: a worship blog click on November 2009 and then on Bulletin for those Preparing for Advent 2009. Week Two: Either Repent! or Rejoice! Week Three: Repent! or Respond! Week 2: Bring the shepherds to the manger. Talk about how tired and dirty and looked down on the shepherds were. Briefly tell the story of the angels’ visit and what that meant to the shepherds. They left the manger aware that God knew who they were and invited them to see Jesus. They had hope.
' If you display a Chrismons tree in the sanctuary every year, it will fairly quickly come to be simply “that beautiful tree in the church” unless ways are found to re-introduce the ornaments and their meaning repeatedly. One way is to explain them to the children during a children’s time or as part of the sermon. Before the tree is up, show the ornaments in your hands. Once the tree is up, use a flashlight to highlight ornaments related to each Sunday’s theme. This year, I found the following connections. Detailed ideas for each one are found in the weekly posts. Week 3: In keeping with the Rejoice theme, find all the stars. Or, if Mary is the center of attention, high the rose ornamenets. Week 4: If Mary is the focus, find all the rose ornaments. Or, if you are exploring the response of all the characters, note the gold and pearls – precious things that are worth turning aside to see and have.
' You will find several reader’s theater scripts for the gospels this Advent. The goal is to help younger worshipers stick with longish stories and help older worshipers pay fuller attention as they hear familiar stories in a new way. Because they are read by adult readers, they address concerns raised by John Bell and others that we have given the Christmas stories to children for pageants which often robs them of some of their power. Planning for Advent and Christmas - Year A with general ideas about celebrating Advent in the sanctuary with children. Christmas Storybooks for Worship started with the worship leaders in the lectionary study group I attend sharing story books they have used in worship during Advent and Christmas. It is not a list of all the cool Christmas books I know, but a list of those I can imagine being read in the sanctuary. Annotated List of Christmas Carols Children Can Sing in the Sanctuary is an annotated list of carols children can be drawn into singing. And of course remember to use the SCRIPTURE INDEX to find idea related to specific texts.